What are you waiting for? Get thrift shopping! Today, our shopping options are virtually endless. If we want, we can shop online from the comfort of our own homes. Or, if we’re in a pickle and need something immediately, all it takes is a quick drive to the local big-box home improvement store to find exactly what we need. When it’s time to replace a light switch or pick some new tile for a Pinterest-inspired home decor project, my first impulse is to head to a store that’s guaranteed to have what I need where I know where it’ll be. 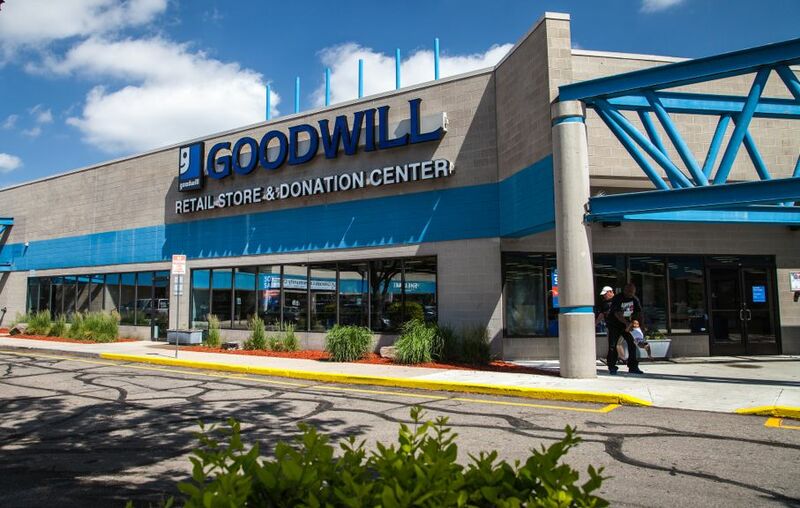 Thrift stores like Goodwill and Habitat for Humanity aren’t usually top-of-mind because I just don’t know if they’ll have what I require to complete a project. But that’s the beauty of thrift store shopping (cue Macklemore) — you may not find what you absolutely need, but you’ll definitely encounter hidden gems at deeply discounted prices. Your local home thrift shop is a gold mine. If you’re looking to improve your home’s aesthetics, comb around to score these five items. If you’ve ever been in the market for a new light fixture — be it a kitchen chandelier or even a floor lamp — you’re bound to shell out quite a bit of money. Of course, lighting does wonders in transforming your space, but sticker shock is quite common. 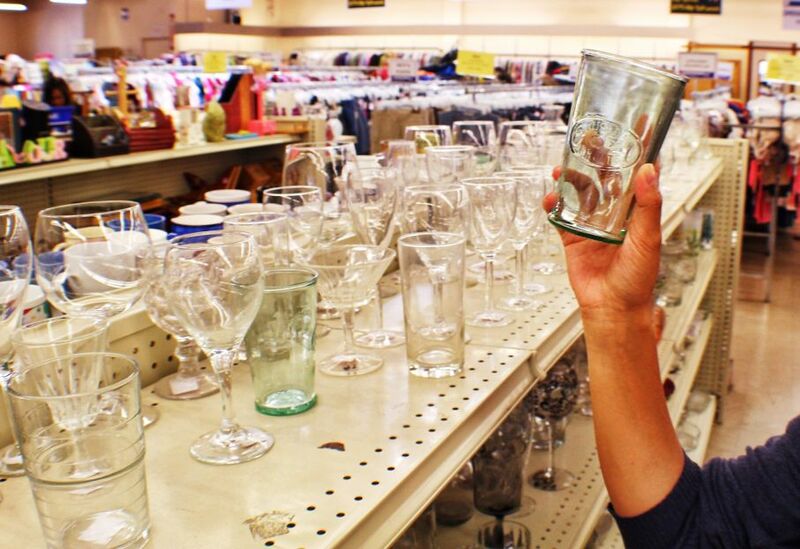 Thankfully, your local thrift store is likely to have lighting options galore. Look past the colors, finish and even the shape of the globes when choosing the perfect fixture for your home. Instead, focus on the fixture itself. Will it fit my space? Does it have a nice or unique design? Remember, all it takes is a coat of spray paint and a few new glass globes to transform an older, brass fixture into one that draws attention. If you’re in the market for a new front door but are hesitant to commit to a custom purchase (again, the sticker shock here is significant) then consider adding a glass insert. You’ll be amazed at how easy it is to size, cut, and install these inserts, and the best part is the finished result — your curb appeal is guaranteed to improve! But before you spend $300 to $1,000-plus on a new insert, check your local Habitat for Humanity. 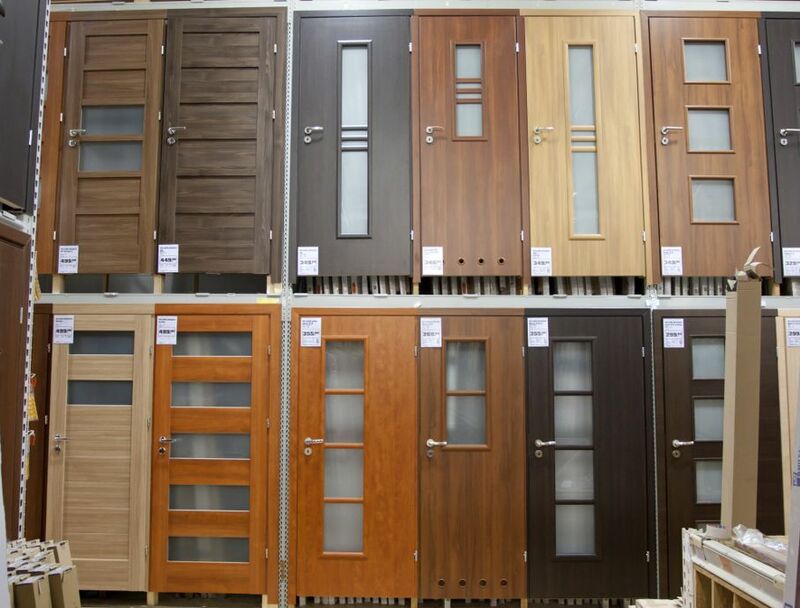 Older doors with inserts sell from $20 to $200. Simply remove the insert and reinstall in your own door. Voila! Entryway perfection. Box stores and other home specialty brands often unload excess, opened, or discontinued flooring at local thrift stores. Depending on what you’re looking for, you could be enjoying high-quality, brand new tile, hardwoods, laminate and even carpet at a fraction of average retail prices. If you can’t find what you’re looking for at your local shop, take a Saturday morning and jump from one thrift store to the next. Chances are, you’ll find a hidden treasure somewhere out there. 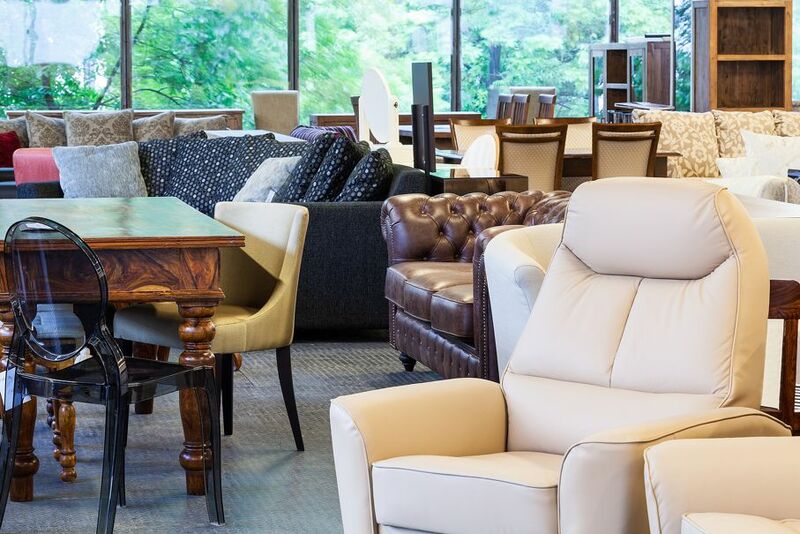 Don’t forget to browse all the furniture while you’re out and about. Sure, you’ll notice a ton of “junky” pieces, but you’re bound to run across some great vintage chairs and antique tables at the same time. Look for furniture made of solid wood and pay special attention to anything that looks like it may have been painted over a time or two. With a little stripping, sanding, and stain, you can transform a worn piece of furniture into something truly special. Before you leave your thrift store, head over to the kitchenwares. Avoid the old toaster and crock pots and instead, dig through all those old plates and glasses. Keep your eyes peeled for Lennox, Bernardaud, and Wedgwood dishes and glasses. You’ll spend significantly less than you would at a department store and you’re bound to turn heads at your next party! 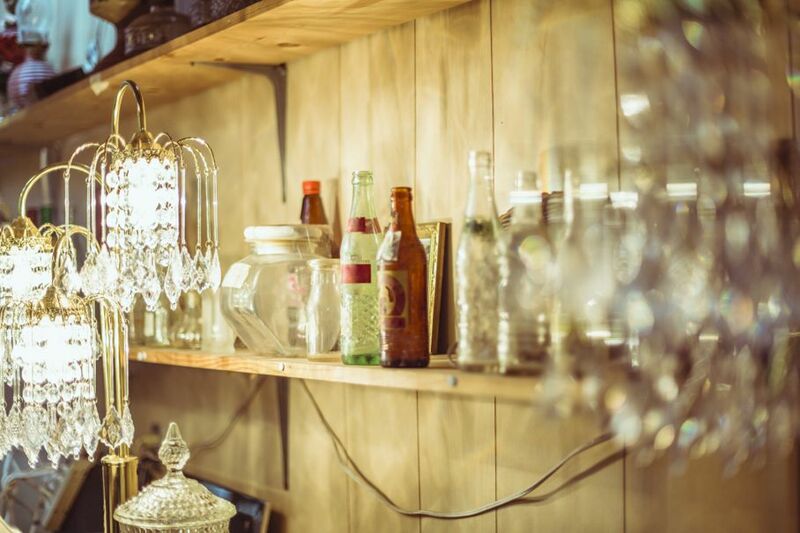 Thrift stores, especially those that specialize in home improvement and housewares, are the absolute best places to go to find hidden gems for your house. These shops are a gold mine of affordable, quality touches with a lot of life left in them. Plus, every purchase usually goes toward a good cause.